Please note that the registration fee does not include entry to the Banquet, the Friday Beneath the Waves Film Festival Social, or the Coastal Studies Center field trip. These events, as well as merchandise, can be purchased along with registration or separately. We will consider all requests for Refunds up until February 20th, 2016. Full-Meeting registration via the website is open until March 11th, 2016. After that time Full and Single Day registration will be available on-site starting 12:00 on March 16th, 2016. ​A delicious meal followed by a DJ and dancing at the Westin Harborview Portland. You will have the option to select omnivore or vegetarian during registration. If you have severe food allergies please contact benthics2016@gmail.com in advance. 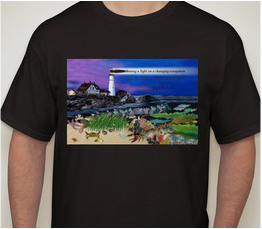 Enjoy a drink at the Gulf of Maine Research Institute (GMRI), more details to come. Visit Bowdoin College's Coastal Studies Center which is situated on 118 acres on Orr's Island. Enjoy a drink and some snacks as you get a tour of the property and, weather permitting, explore the 5 miles of trails on snowshoes or cross country skis. Beer/Wine and snacks will be provided. A great souvenir with this year’s conference logo. Important! If you are presenting, make sure to use the same email address on your registration form as on your abstract submission! Visit the Information for Presenters page for abstract submission guidlines. We are looking for a limited number of volunteers to help during presentation sessions. Volunteers will receive a $50 discount on registration. If you want to help out, please send an email to benthics2016@gmail.com with the subject line “Volunteer” and include your name, institution, and status (e.g., student). Volunteers will be reimbursed the $50 after they have completed their volunteer duties. Click here to make reservations at the Westin Portland Harborview.